This evening I was just hanging out, watching some 30 Rock on my laptop, petting the cat, having a nice quiet evening at home, when disaster struck. The cat got tired of me, as cats do, and jumped off my lap to go entertain himself elsewhere. In the process he got his feet caught in the power cable. I watched, paralyzed with horror, as my precious computer leapt from my lap, spiraled through the air slo-mo Matrix style, and descended to the tile floor with a sickening crash. BAD kitty! My precious baby is gone. 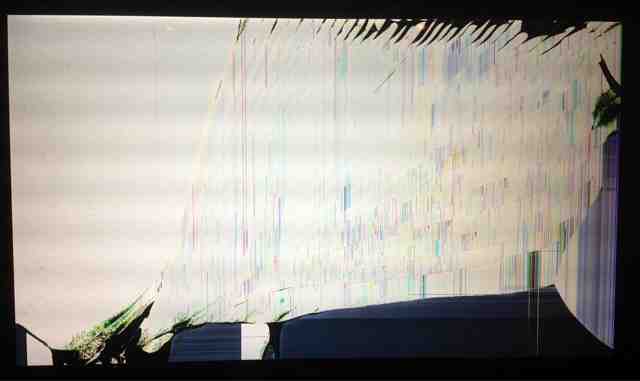 The screen, while outwardly intact, has ceased to be a functioning feedback mechanism and now more closely resembles a high-concept contemporary art piece bristling with social commentary on the ever-increasing role technology plays in modern life. I'm thinking of selling it to MoMA. As for the rest of it, the diagnosis is uncertain. The video I was streaming actually kept running after the fall, so I have some hope that the innards are more or less intact and my data can be saved. Later I tried plugging it into my TV in the hope that the screen was the only damage, but alas, that does not seem to be the case. The few pixels that are still working now show the characteristic hue of the Blue Screen of Death. I'll pull out the hard drive and bring it home with me to see what can be done. At least I no longer have to figure out how to fit a cat and a laptop in the same carry-on bag. I was planning to upgrade to a new laptop this summer anyway so I'm not terribly upset, but the timing is inopportune. I obviously can't just run down to the Best Buy in Conakry ville, so I'll be iPad-only until I get back to the States. I bought this thing to be my travel computer, and I guess now is as good a time as any to put it to the test. I have already decided that a keyboard might be a good idea. Hand cramp!